A significant proportion of basal and squamous cell cancers that are referred to me (as a Plastic Surgeon) can be managed in our office procedure room on an outpatient basis. This involves the use of local anaesthetic, a single use sterile instrument pack, suture repair and simple dressings. These dressings are almost invariably removed within 12-24 hours, and the wound then washed / showered daily. 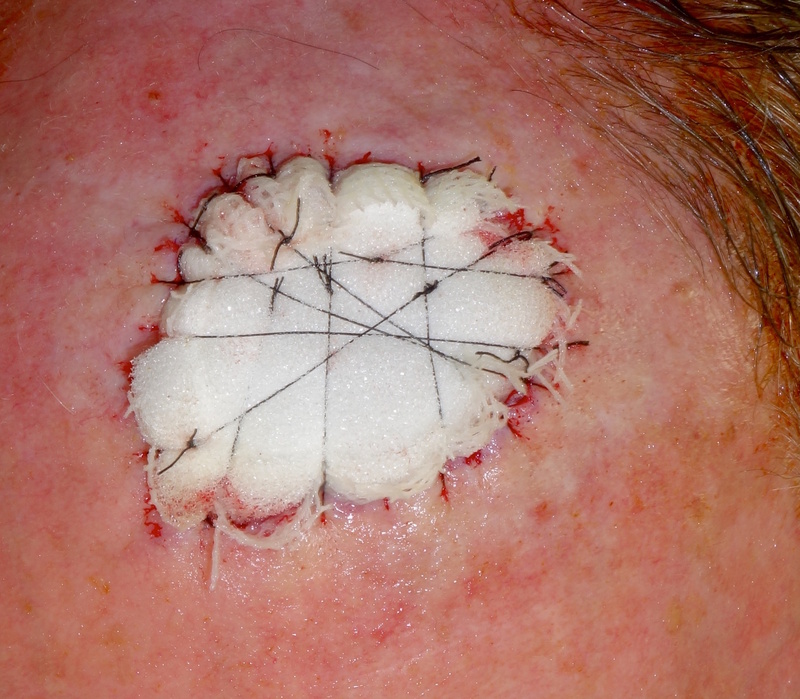 Suture removal may occur between 5 days and 3 weeks depending site of the skin cancer, tension on the wound closure and the patients planned level of activity. 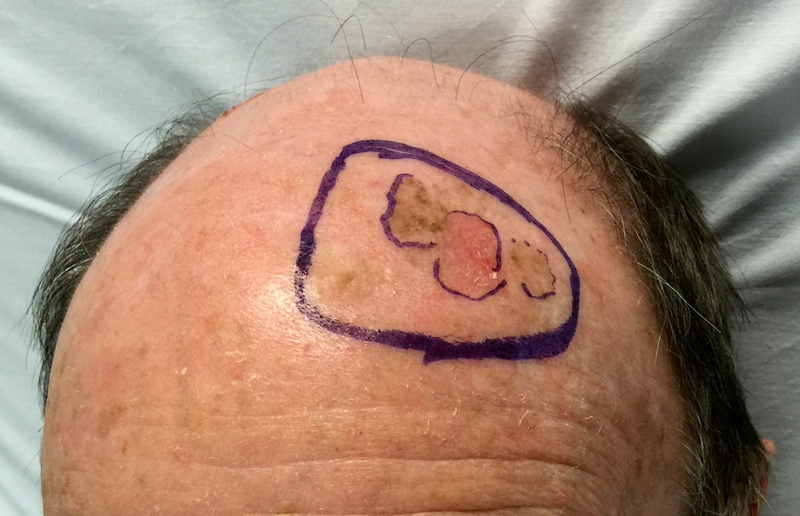 When skin cancers are larger or located on more challenging sites, surgery may be more appropriately undertaken in a Day Surgery facility or indeed with an overnight hospital admission. All skin cancers removed by excision are submitted to examination by a Pathologist to confirm the exact nature of the tumour and ensure that complete removal with an appropriate margin has been achieved. Wounds repaired with flaps generally cared for in much the same way as described above. 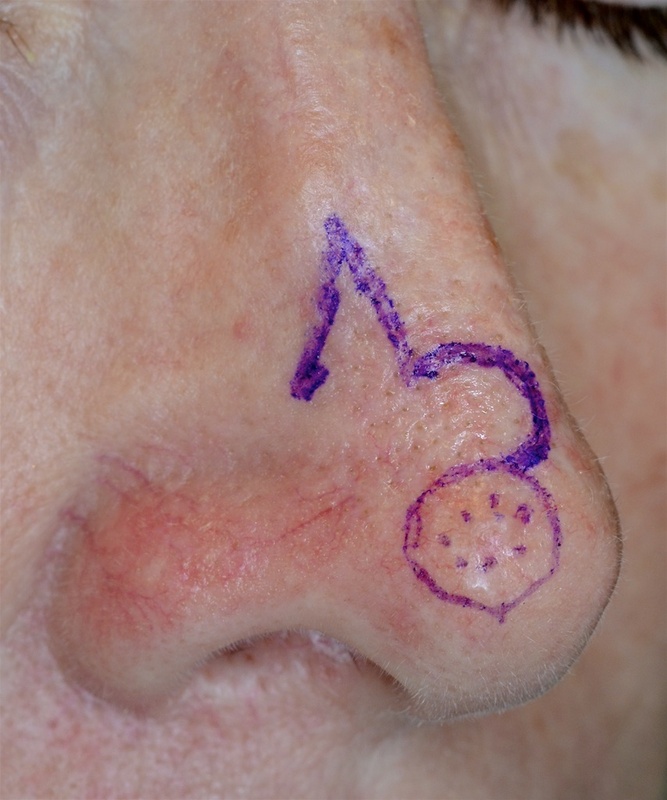 Conceptually, a flap can be thought of as the transfer of skin from area of relative laxity (tissue abundance) into a defect (typically after skin cancer removal or a trauma defect). The transferred tissue is nourished by an underlying blood supply (tissue bridge) that is is transferred along with the skin. 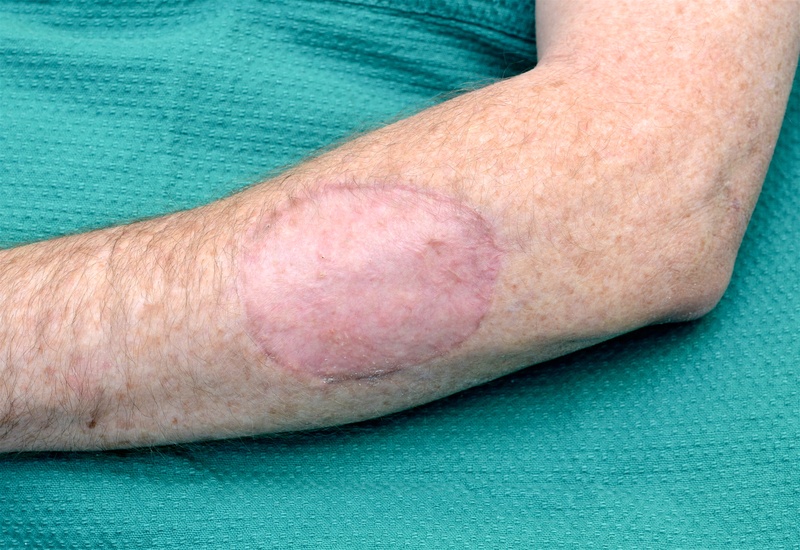 Because all the skin is vascularised wound healing is typically reliable and wound care simple. Some examples of commonly used flaps and their healing/wound care are illustrated below. 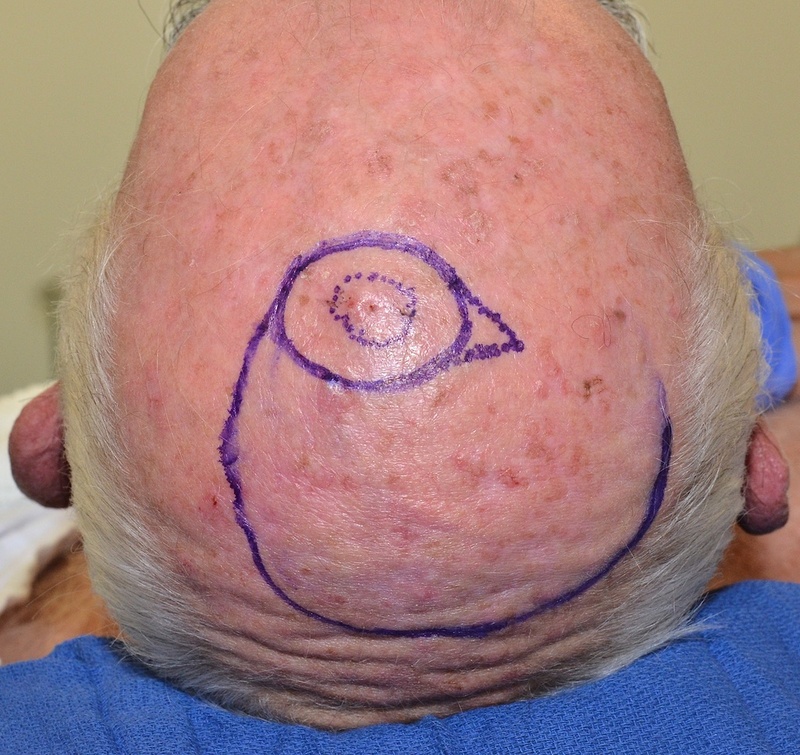 The visibly apparent skin cancer (BCC) is outlined with dotted marks and the actual excision and planned flap (transfer of skin) indicated by the heavy blue line above. Wound 7 days after surgery. Wound care has consisted of normal showering and simple application of an antibiotic ointment once a day from the first post-operative day. 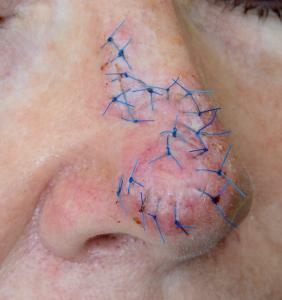 Sutures are typically removed 6-8 days later. Wound immediately after suture removal. Wound 3 weeks after surgery. Scars vary greatly with every patient but always progressively improve for many months. 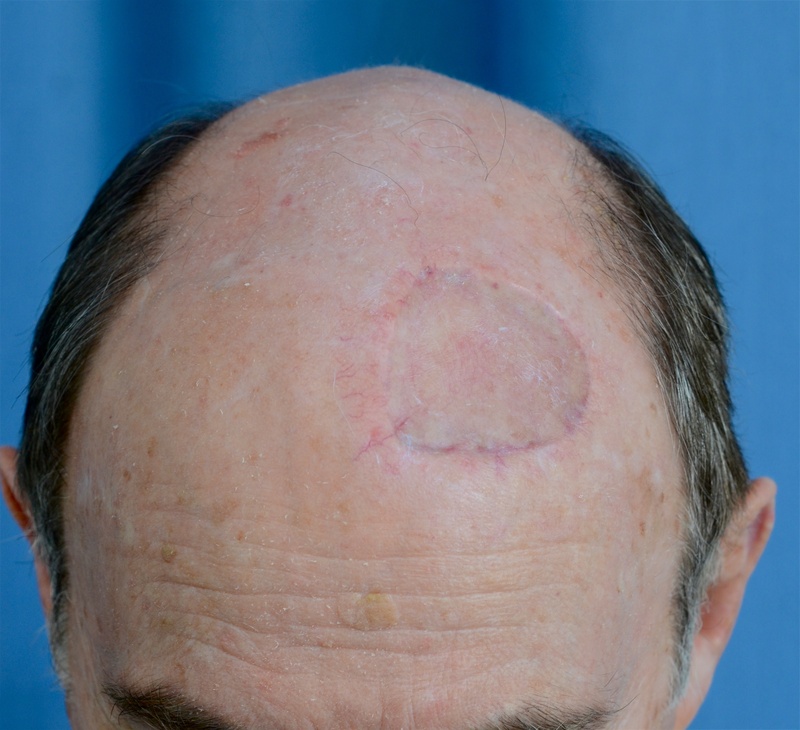 Scalp Rotation Flaps are used when ever possible to repair scalp defects as they provide optimal cosmetic repairs and are very easy to care for post-operatively. 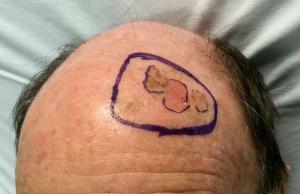 The pre-invasive melanoma is delineated by the dotted outline. The planned excision and flap repair is drawn. 10 days post-operatively the wound is ready for the staples to be removed. Wound care has simply consisted of showering to wash the wound from the first post-operative day. 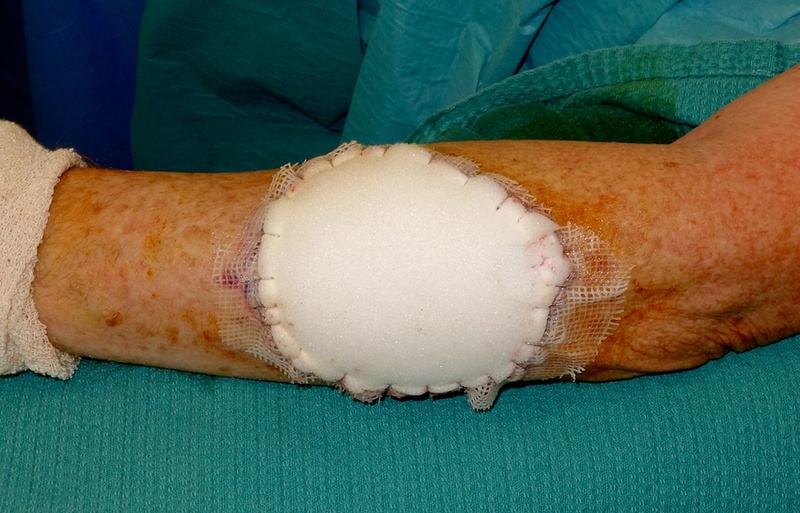 Keystone Flaps are commonly used to repair larger excision defects and are especially useful on the limbs as they can often obviate the need for a skin graft. This allows for a more rapid recovery, superior aesthetic appearance, and substantially less complex wound care. 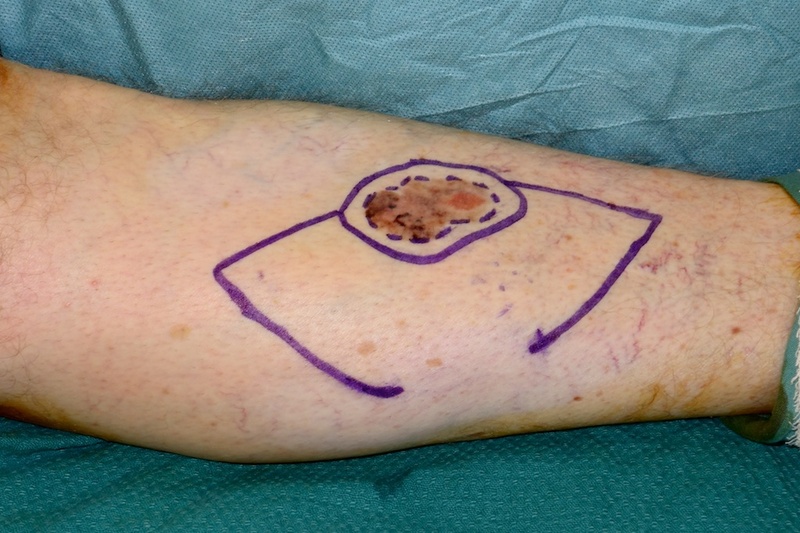 The planned excision and modified keystone flap repair of an early melanoma on the lower leg has been planned. 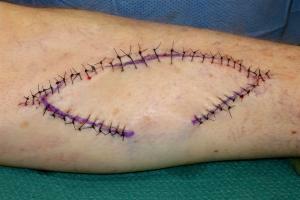 Sutured wound at the end of the surgery. Wound care has simply consisted of gentle washing during normal daily showering and the application of a small amount of Betadine/antiseptic solution daily. 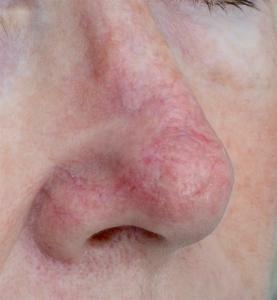 A small amount of resolving bruising is apparent. Sutures are typically removed after 3 weeks. 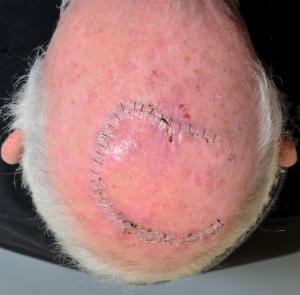 Similar wound at 3 weeks immediately prior to suture removal. Full thickness skin grafts are ofter used to repair wounds on the face. 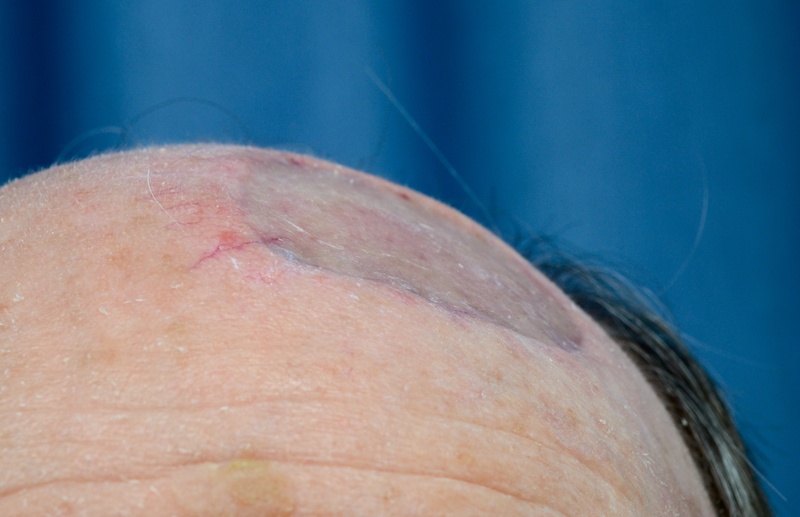 A piece of skin with appropriate characteristics (texture, colour, thickness) is obtained from a donor site that can itself be closed directly with sutures and is usually located at a relatively inconspicuous site. 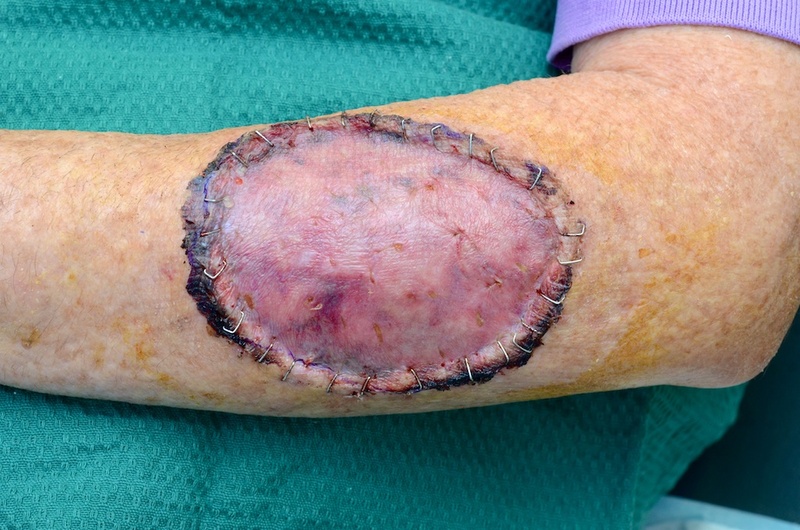 The graft is then carefully secured into the original wound (usually the site of a skin cancer excision or an injury when skin has been lost). 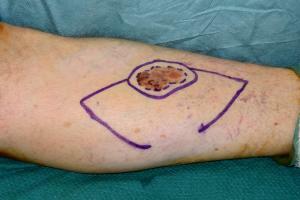 The dressing is designed to encourage blood vessels in the base of the defect to grow into the graft. The initial process of graft vascularisation typically takes 7-10 days and it is highly desirable that the graft is held securely against the wound base. 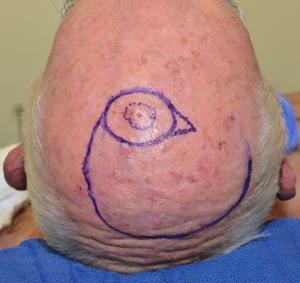 A diffuse area of pre-invasive melanoma and planned excision. 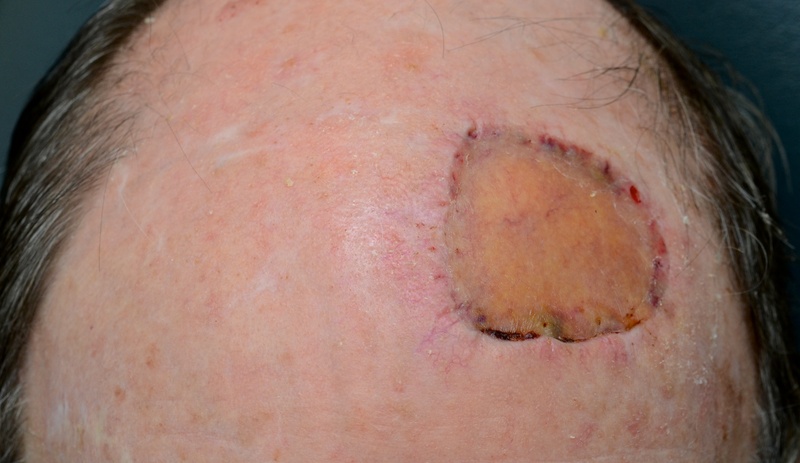 Skin graft has been secured beneath a foam pack to immobilise it against the excision defect. 10 days post-operative. The stabilising foam dressing has been removed and the skin graft has established a very significant blood flow/circulation. Another week later and the blood flow through the skin graft has returned to more normal levels and is hence less red. 6 weeks post-operatively the skin graft continues to heal very well. The graft has significantly increased in bulk. The repaired defect has a progressively decreasing contour defect as the graft incorporates. This is a particular quality of full thickness skin grafts compared to thinner split thickness skin grafts. 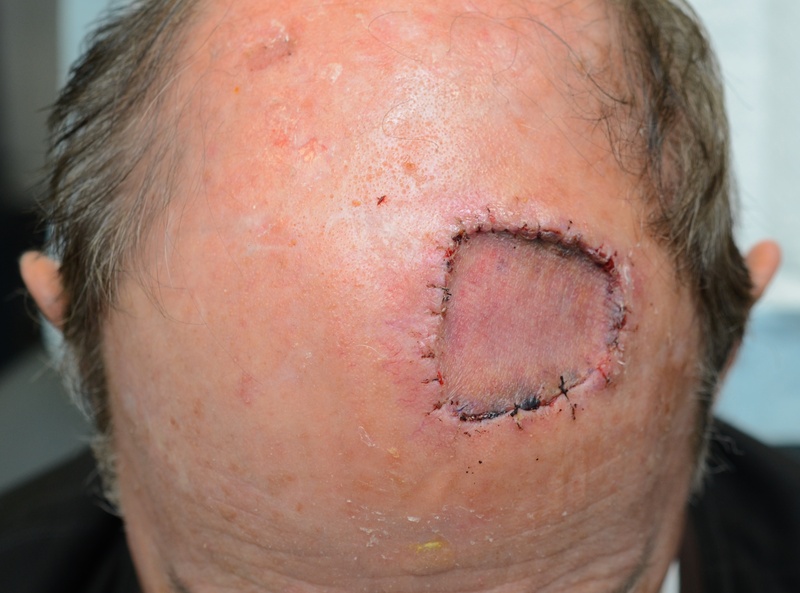 Larger excision defects and trauma wounds may not be suitable for repair with either flaps or full thickness skin grafts. 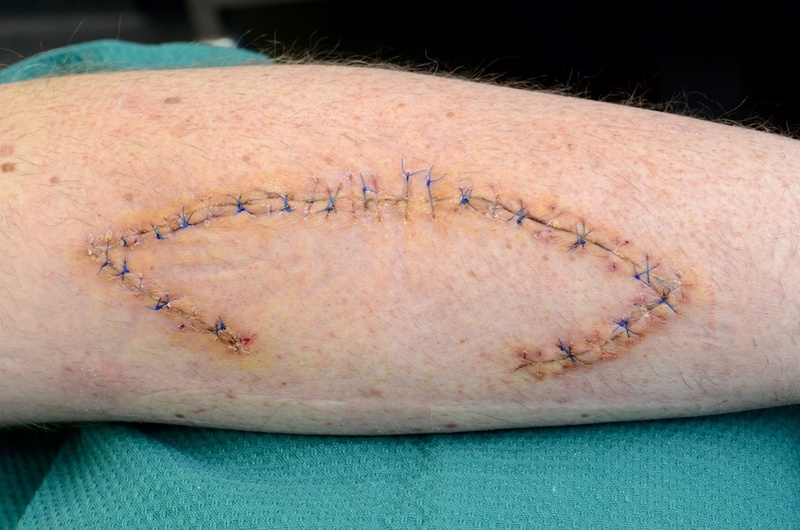 In these instances a skin graft consisting of only a portion of the skin may be the most appropriate way to repair the defect. 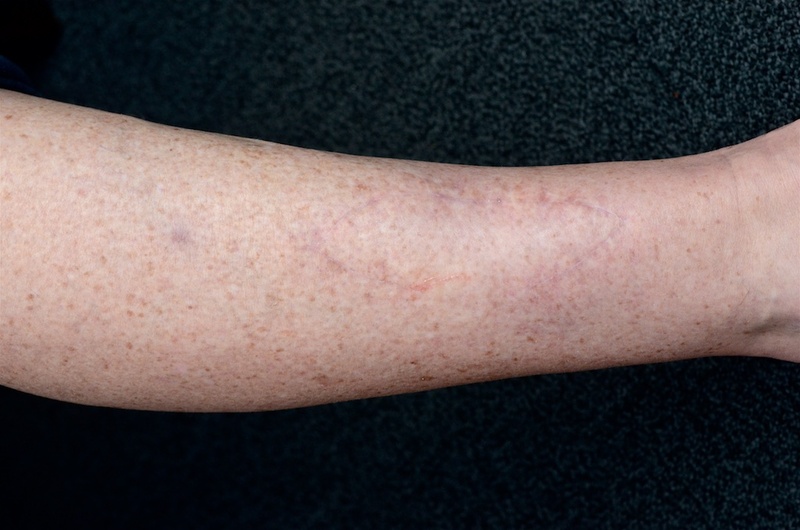 These grafts are generally reliable but issues such as vascular disease, diabetes, pre-existing infections, and wound sites on the lower limb can present challenges. 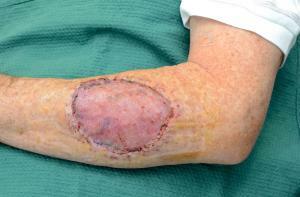 Excision of an extensive but fortunately superficial melanoma on the forearm is planned. A sheet of split thickness skin has been harvested throw the patient’s thigh and secured into the excision defect. 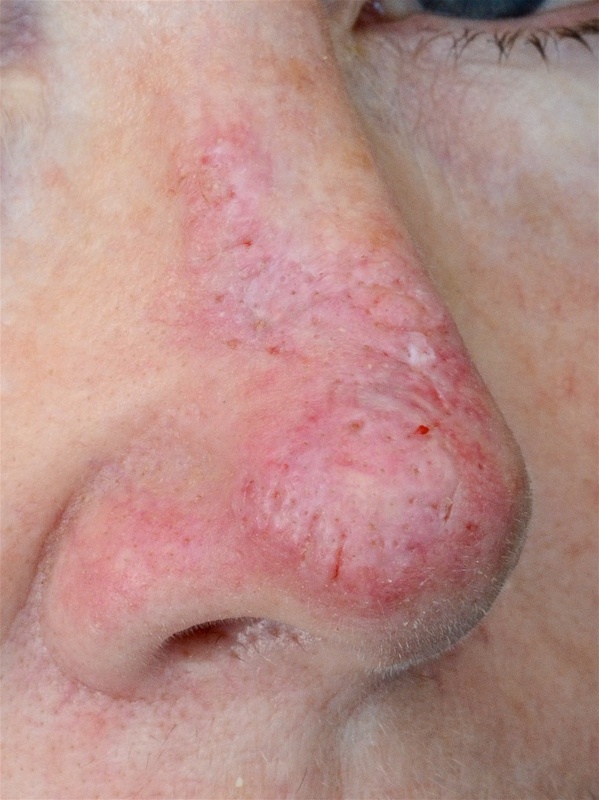 Numerous small perforations have been in the graft to prevent fluid collecting between the graft and the base of the wound. At the end of the surgery the graft is secured beneath a foam pack. 7 days post-operatively the foam pack has been removed. 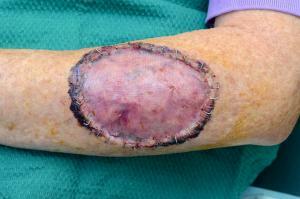 The skin graft has developed a good blood supply from the underlying wound base. At the periphery of the graft, where it overlaps the underlying skin edges, the graft has desiccated. This is entirely normal and simply trimmed. 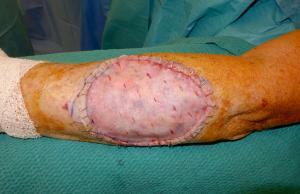 A week later the skin graft is more mature and incorporating extremely well. Over the coming weeks the graft will thicken and the contour depression reduce. Appearance after 10 weeks. Note that the contour of the graft has improved substantially.